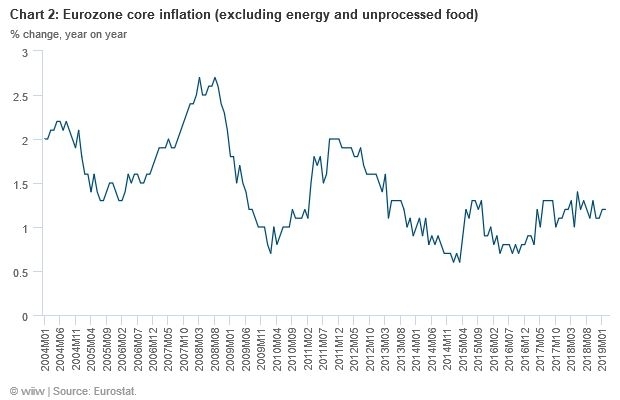 Where is the inflation in CESEE? In the context of rapid wage growth, inflation remains mysteriously low. This reflects a combination of factors, and may not change anytime soon. Inflation in most parts of Central, East and Southeast Europe (CESEE) is surprisingly weak, particularly in the context of last year’s sharp increase in oil prices and the very strong wage rises in some countries. At first glance, the general lack (so far) of pass-through from very strong and sustained wage growth to headline inflation presents something of a mystery. Several factors are likely to explain this: high levels of integration with the euro zone (where inflation is even weaker), strong productivity growth, higher levels of competition in the consumer goods sector, and a de-anchoring of expectations. With the exception of Hungary and some parts of the CIS, we do not expect current inflation dynamics in CESEE to change fundamentally in the coming years. As a result, most central banks will stay on the dovish side. Much of the CESEE region at least flirted with deflation in 2014-2016, but this episode now seems to be decisively over, with price growth back in positive territory everywhere. 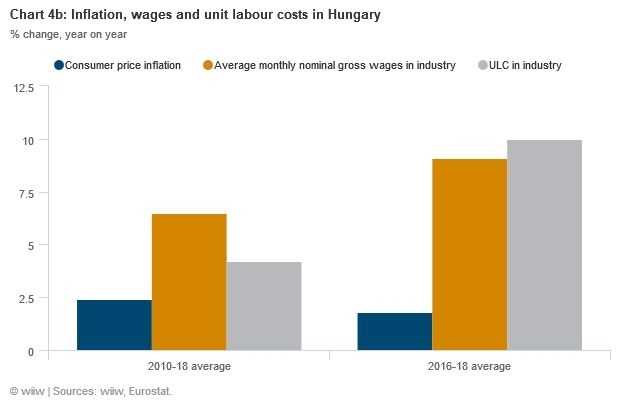 However, particularly in EU-CEE11 and parts of the CIS and Ukraine, real wage growth is running well ahead of inflation (chart 1). In 2018, only a few countries posted significantly higher (i.e. more than a couple of tenths of a percentage point) inflation than in the previous year, and in almost all of them it was due to overheating/idiosyncratic factors (Bulgaria, Romania, Slovakia, Hungary and Turkey). The rest recorded either negligible increases or declines relative to the previous 12 months. Several countries stand out in the region for having recently had particularly high nominal wage growth in relation to inflation (i.e. very strong real wage growth): Romania, Ukraine, Belarus, Hungary, Russia, Albania, Lithuania, Bulgaria, Czech Republic, Latvia and Poland. For these countries, nominal wage growth was at least 5 percentage points higher than headline inflation in 2018. In all cases, this was well above the post-crisis average. 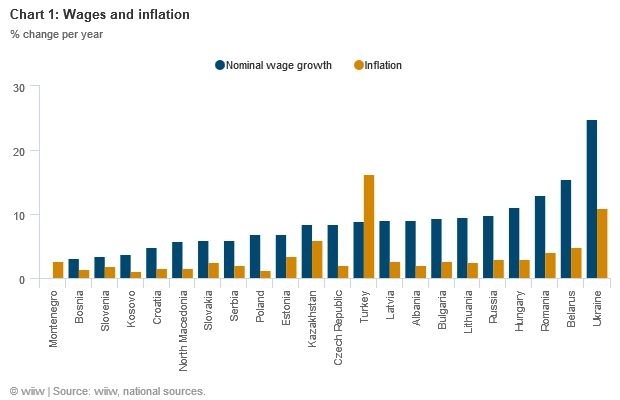 Only two countries – Turkey and Montenegro – posted wage growth below inflation last year. Much of the wage growth is being driven by increasingly acute labour shortages in the region. First, inflation is going nowhere in most of the eurozone (chart 2). Given the very high degree of trade integration between most of CESEE and the single currency area, this is likely playing a role (and possibly the decisive one). Second, there remains substantial slack in some parts of the economy, partly as a legacy of the crisis, and this is now being eaten up by productivity gains (see charts 4a and 4b and longer discussion below). Third, it may be that, after years of subdued price growth, inflation expectations have de-anchored, leading to a more permanent state of ultra-low inflation/deflation. Fourth, looking at inflation breakdowns, there appears to be a fairly standard consistency in consumer-focused products (such as furniture or household equipment) falling in price. In addition to this, retail trade value and retail trade volume are growing at similar rates in most countries. All of this suggests that firms selling consumer goods are struggling to increase prices, indicating either that competition is playing a much greater role (see below), or that consumer demand is not as strong as it appears. Fifth, and linked to the previous point, it may be that consumer goods are predominantly being produced abroad, and that therefore exchange rates could be playing a role. After fairly sustained and significant post-crisis appreciation, since the start of 2015 the Chinese yuan has steadily depreciated against the euro. Sixth, low international food prices are likely to be playing a role. Food prices tend to be the biggest component of the consumer price index (CPI). According to the Food and Agriculture Organization of the United Nations (FAO), global food prices have fallen for six of the last seven years. Between 2011 and 2018, the FAO’s global food price index fell by almost 27%. 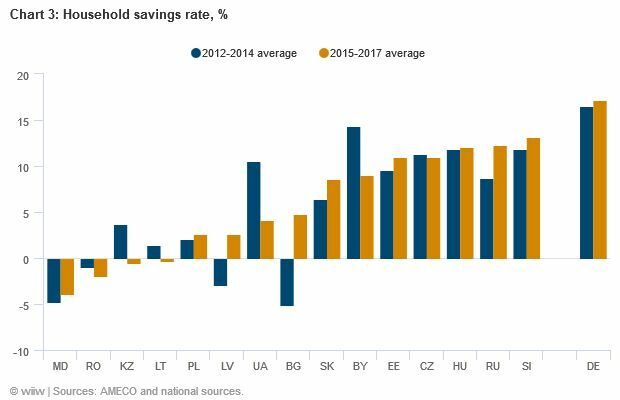 Seventh, higher household savings rates may be playing a role. We find evidence for this in some countries for which full comparable data are available, but by no means in all (chart 3). Eighth, there appears to be evidence that the rise of online retailers has had a disinflationary impact on the overall price level. Ninth, it is possible that the fact that the labour income share is at a historically low level in many countries means that wage developments do not matter as much for inflation as in, say, the 1970s. Finally, several of the wealthier parts of CESEE (such as Poland and the Czech Republic) now host a lot more immigrants (often from other parts of the region), meaning that a greater share of the money earned in those countries is not spent there, but rather flows out in the form of remittances. The argument in favour of a de-anchoring of inflation expectations finds some support in recent literature. A recent ECB paper that looks at the four biggest eurozone economies between 1985 and 2018 showed that this is perhaps less surprising than might be assumed. After a period of low inflation – as is the case now – the wages/price relationship was weaker (at least in these four eurozone countries over this period). This could imply that expectations about inflation become de-anchored, and economic agents expect low prices to continue, even as their nominal wages rise. The argument about improved productivity offsetting nominal wage rises also remains quite persuasive for CESEE, and finds some support in the data. In most countries for which data are available, we find that unit labour costs are rising much more slowly than nominal wages (implying productivity gains), and this is mirrored in low inflation (we use data for industry as the sector generally most exposed to international competition). 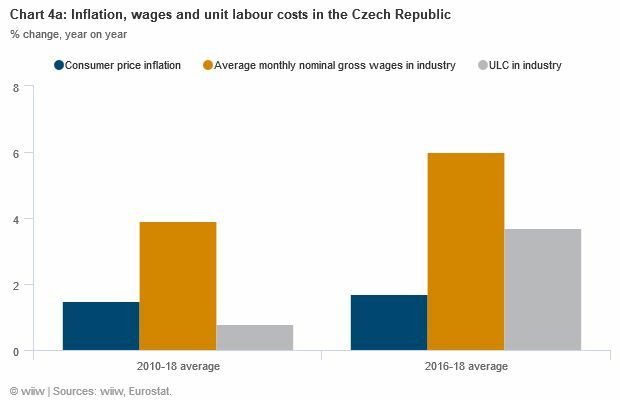 This is certainly the case in the Czech Republic (chart 4a), the country with the most acute labour shortages, for example; but it also applies to most other countries in the region. Our conclusions overall are unchanged from a similar analysis conducted in 2016: Wage increases are being offset by improved labour productivity. However, rather different developments can be observed in Hungary (chart 4b). At least over the past couple of years, unit labour costs have risen more quickly than wages in industry, implying that productivity is declining marginally. This could indicate that problems may emerge with regard to inflation. Hungarian core inflation is now running at well over 3%, which is high by EU-CEE standards. More generally, it is clear that in most countries unit labour costs have risen much more quickly in the last couple of years. Delving deeper into the inflation dynamics of those countries that generally operate with inflation-targeting monetary regimes, two things become noteworthy. First, the role of energy prices (demonstrated by the ‘transport’ component of the EU-harmonised index of consumer prices) has recently had a big impact on overall price growth, reflecting the sharp rise in Brent crude prices last year. Second, there appears to be a clear weakness of price growth in sectors that are reliant more on discretionary consumer spending. Of these countries, only in Romania is there any sign of price growth edging toward 2% in segments such as clothing/footwear or major household appliances. This suggests still rather ‘soft’ consumer demand conditions, implying that consumers are not allocating all of their higher wages to increased spending (or that higher competition or online retail are depressing price growth in these sectors). Moreover, high frequency data indicate that retail trade growth is trending down in these countries, albeit from high levels in at least some of them. With the exception of some CIS countries (where inflation fell quite sharply last year, and will bounce back), and to an extent Hungary, we do not expect current inflation dynamics in CESEE to change significantly during the forecast period. Looking at the scale of labour shortages and the wage response, one might conclude that a spike in inflation is imminent. However, as demonstrated, these conditions have been around for several years, without any apparent inflationary response. In the absence of a sharp increase in international commodities prices, it appears likely that a combination of the factors listed above will keep inflation at historically low levels in most of CESEE during the forecast period. We expect oil prices to be generally flat during the forecast period, meaning that the large positive contribution to headline inflation from transport costs last year will not be repeated. As a result, most central banks in CESEE, as well as the ECB, will maintain a dovish monetary stance. Real interest rates in CESEE eurozone countries, the Czech Republic, Poland, Hungary and Romania have fallen notably since 2016, and in many cases are firmly in negative territory. Although this is not having an notable impact on consumer price indices, the impact of this policy is visible in other areas, not least the housing market (see our recent CESEE credit monitor for more details).